According to the Occupational Safety and Health Administration (OSHA) forklift standard for powered industrial truck training [29 CFR 1910.178(l)], forklift operators are to be trained on a variety of subjects regarding forklift safety. One of those items is the proper daily safety inspections of the operators forklift and any maintenance that must be accomplished before work is performed. Most manufacturers will provide a detailed inspection checklist in the operators manual provided when you purchase a new forklift. This is definitely something you will find when purchasing a new Forklift from Hyundai Forklift of Southern California. Althought these check list may be very detailed, they may not always be fully inclusive of everything your forklift may need to be checked for as a result of additions or modifications made on the lift prior to delivery. With this in mind, it is a good idea to review these changes with your dealer to make enhancements to your checklist. It is also a good idea to have the unit inspected regularly by your dealer, who’s job it is to stay up to date on changes in technology and safety regulations. 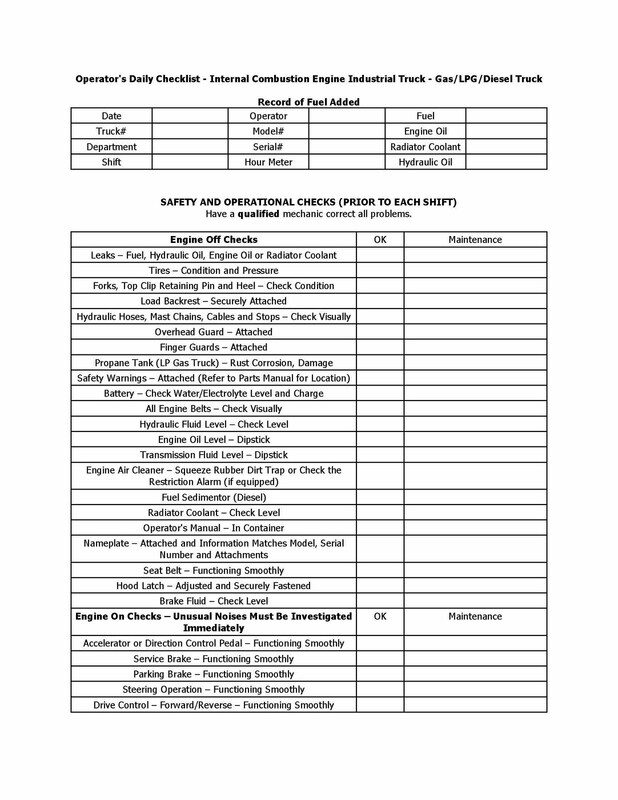 If you are not able to come up with a source for inspection checklist, OSHA provides some guides for creating your own. Since there are basically two major types of forklifts, gas/propane/diesel and electric, OSHA offers two sample checklists. Look for more details on this part of forklift safety training on OSHA’s website by clicking here. Don’t forget, that Hyundai Forklift of Southern California can help you with this process, just ask our service department. We also offer Forklift Safety Certification training for experienced operators.